The photo at the top of this web page is of the inside of one of the private Phuket villas we rent while this link is to more photos of Phuket villa rentals in the north of Phuket. Shear new luxurious villa rentals. Luxury villa rentals near northern Phuket beaches. Private villas with walled courtyards. Walled villa estate with dedicated security gards at the gate make for safe secure villa rental Phuket. Also there is a helpful 24/7 Phuket resort duty manager and reception hospitality to welcome you and answer your needs with helpful service. Being near the Sarason bridge which connects Phuket island to Thailand means easy access to Kho Lak, Phang Nga Bay, the road to Samui, Bangkok and Krabi. Biggest discount, best deal on luxury Phuket villa rentals. From advertised over $1,000 per night on Google maps and OTAs to $200 per night. That's at least at 500% disount price on luxury villa rental in Phuket. This villa rental discount deal is available because of direct dealing with a condo timeshare owner rather than a travel agent or OTA. As you can see we're not web designers so when you've sent the online booking form, you're dealing directly with time share owners in Australia. Fantastic guided kayaking through dark bat filled caves under karsts to patches of water surrounded by jungle covered karsts and monkeys sitting arms length away on oyster covered rocks. For me it was the trip of a life time and best of all it was free. With a couple of thousand baht extra I was able to bring my Thai boy. Visit to awesome Hong island where on the beach you can explore caves, interesting geology, and get great, classic photos of James Bond island. 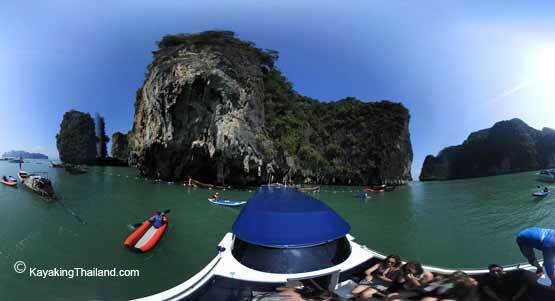 Speedboat to the beautiful, classic tropical island beach at koh Rang Yai. Property managers are a good brand resort hotel chain. Villas are near to a pub, restaurants, and Swensen's icecream parlour. Villas are walking distance close to a beautiful northern Phuket beach. With these VR photos of Phuket luxury villas, it's not hard to magine your family holiday rental near this tropical island beach in Thailand. Phuket information about accommodation and things to do near Phuket beaches. World's Best Beach Holidays including best beach destinations in Thailand.